I have trawled the High Street to find the best bargain buys on dresses for that special occasion or summer event. If you still need an outfit for a summer wedding or Wimbledon then there's no time to lose. These gorgeous dresses are available now but won't be around for long! One of my favourite dresses of the season has got to be this gorgeous blue spot chiffon dress from Reiss. And I now love it even more as its £136 (from £195)! 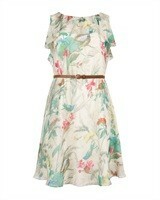 This beautiful bird printed dress from Ted Baker is an absoulte steal at £70 (from £139). In soft pretty pastels it has ruffle detail at the shoulder and the belt is included too. In bold 'poppy' red this dress from Warehouse will certainly make a statement and now only £55 (from £75). It has floral tapework panelling over the bodice and a gorgeous waisted full skirt - love it! This beautiful chiffon dress from Monsoon has a pleated bodice and V front and back detail. It's down to £50 (from £70) and comes in a range of colours. If you're looking for something you can dress up or down then this striking silk Ikat printed dress from Comptoir des Cotonniers does just the job. Now down to £89.60 (from £128) it's a great investment - one of those dresses that will take you anywhere! And for something more casual go for this chambray button front shirt dress with turn back sleeves and waisted tie belt from Banana Republic -now only £49.99 (from £65). Great with flip flops for a laid back look or dress it up with a tan pair of wedges.